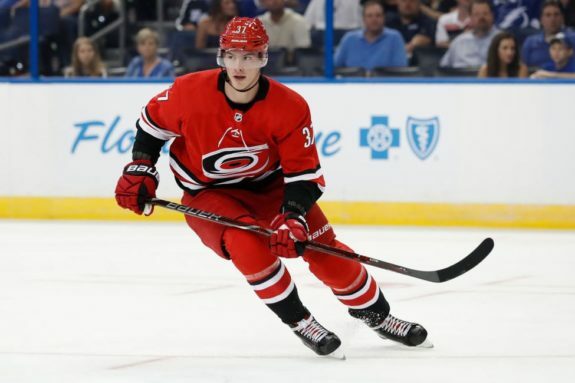 RALEIGH, N.C. — Warren Foegele scored his first goal since October, Petr Mrazek made 23 saves in his first shutout of the season and the Carolina Hurricanes beat the Arizona Coyotes 3-0 on Sunday. Defenceman Calvin de Haan had two assists for the Hurricanes, who won for only the second time in seven games this month. Andrei Svechnikov and Sebastian Aho also scored for Carolina. The Hurricanes had coughed up a three-goal lead in Friday’s shootout loss to Washington but were able to close out the Coyotes, who lost for the fifth time in six games. Foegele, a rookie left winger, scored three times in the first four games of the season. He had a goal in a 5-3 win over Vancouver on Oct. 9 but hadn’t scored since, a span of 27 games. Foegele beat Arizona’s Nick Schmaltz to a rebound of a hard shot by de Haan and deposited the puck past goalie Adin Hill at 9:44 of the second period to give Carolina a 1-0 lead. Svechnikov made it 2-0 four minutes later with a high shot past Hill from the slot. The Hurricanes caught the Coyotes in a line change, and the rookie right winger made them pay. Justin Faulk fed Svechnikov on the breakaway. Arizona had a goal waved off for high-sticking by Alex Galchenyuk at 4:07 of the final period. Twenty-five seconds later, Aho converted a neutral-zone turnover into his team-best 12th goal of the season. NOTES: The Coyotes have the top penalty-kill unit in the NHL. They killed off all five of Carolina’s power-play opportunities on Sunday. … Forwards Jordan Staal and Micheal Ferland were out for the Hurricanes. Both have been dealing with concussion issues. Staal has missed five straight games and Ferland has missed seven of the past eight. … Carolina captain Justin Williams has a five-game points streak. Coyotes: Host the New York Islanders on Tuesday night. Hurricanes: Host Detroit on Thursday night.